Zynga is kicking off its nine-day road show, trying to woo fat-cat investors and fund managers for its upcoming IPO. If everything goes as planned, Zynga's deal should be priced on the night of Dec. 15 and the stock should begin trading publicly the following morning. If you're not familiar with the undisputed champ of social gaming, odds are that you're not a fixture on Facebook or into smartphone app gaming. Remember when everyone was asking you to lend a hand with their virtual Farmville digs last year? Do you find yourself swapping tiles in Scrabble knockoff Words With Friends? All of that, and much more, is Zynga's handiwork. Zynga itself may not be a household name outside the social networking world, but it's a very profitable company posting huge top-line gains. There are 227 million active monthly players across Zynga's network of games, with 54 million active gamers on any given day. Zynga's serving up 2 billion minutes of game play a day. Die-hard gamers may cringe at the simplicity of Zynga's titles. Even the company's more advanced interactive adventures -- Empires & Allies and Mafia Wars 2 -- aren't as richly detailed as traditional computer and video games. It doesn't matter. Folks apparently crave these bite-sized gaming experiences that can be tackled a few minutes at a time. After posting losses in its first two full years of operation, Zynga easily turned a profit last year with net income of $90.6 million on $597.5 million in revenue. Earnings have dipped slightly through the first nine months of 2011, but revenue is already at $828.9 million. 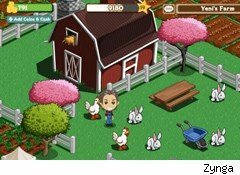 Analysts feel that Zynga will now hit the market with a market cap of $10 billion. It's a big number for a three-year-old company, but lower than the $15 billion to $20 billion valuations that were being tossed around when the company first filed to go public. A volatile market and the poor performances of recent dot-com IPOs are weighing down Zynga's valuation. Is it worth it? At $10 billion, Zynga would command a larger market cap than gaming software icon Electronic Arts (ERTS), though considerably less than market leader Activision Blizzard (ATVI). Both of those companies are generating far more revenue than Zynga, but they're certainly not growing as quickly. The viral nature of Zynga's social gaming stronghold can't be underestimated. There are 4 billion in-game user-to-user connections through its network of gamers living in 175 different countries. The challenge for potential investors is to avoid getting burned by a ridiculous open. The first trading day can get pretty out of hand. Groupon (GRPN) went public at $20 last month but the first trades took place at $28. Now that Groupon shares have dropped into the teens, the early investors are probably regretting their knee-jerk buy orders. Zynga is a dynamic company, and it may live to be worth far more than the likely debutante pop it receives later this month. However, just make sure you know what you're buying and how much you're paying for it. Die-hard and casual gamers alike can probably agree that you don't start playing a game until you know all of the rules. Longtime Motley Fool contributor Rick Munarriz does not own shares in any stocks in this article. The Motley Fool owns shares of Activision Blizzard. The Fool owns shares of and has written calls on Activision Blizzard. Motley Fool newsletter services have recommended buying shares of Activision Blizzard. Motley Fool newsletter services have recommended creating a synthetic long position in Activision Blizzard.